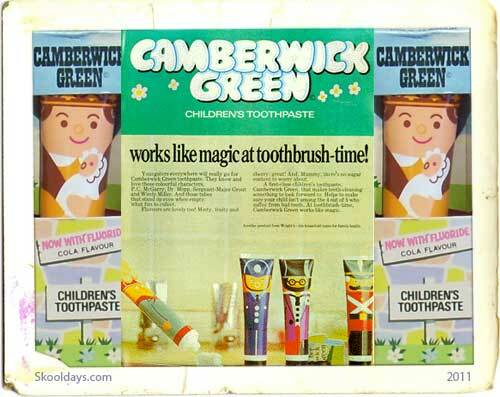 Camberwick Green Toothpaste, now how wrong is that!? After having Trumpton, Chigley and Camberwick Green they decided it was time for a Toothpaste for kids. These soft plastic tube depicting Captain Snort from Pippin Fort or Dr Mopp were full of strawberry or orange flavoured toothpaste. Gordon Murray’s peerless creation defined the genre in so many areas, not least in its spin-off merchandising. The world was innocent and sweet back then, a world in which no job was too small for the emergency services and in which a four-year-old could happily lose himself, emerging only occasionally to demand tie-in toothpaste. I never had a filling until I was 12. That’s how good Camberwick Green toothpaste was. Camberwick Green (1966) begat Trumpton (1967), which in turn begat Chigley (1969) – the body of work that cultural historians now refer to as “the Trumptonshire trilogy”. Camberwick Green was rural, Trumpton was urban, and Chigley was neither one thing nor the other and may possibly have been a series too far. I think Brian Cant’s voice it some ways gave a security that it was just so right to watch and trust it. In the UK millions of us kids earliest television memory was being asked by Brian Cant to guess the contents of a box, a musical box, wound up and ready to play. It was often Mrs Honeyman from the chemist’s. On a good lunchtime, though, it would be Mickey Murphy, the baker, or the bizarrely bearded Dr Mopp – or, better still, Windy Miller, whose windmill made a noise like someone carefully breaking a cello, and whose unparalleled ability to emerge from his front door without getting decapitated by the sails remains one of the greatest feats of timing that British television has ever seen. Everybody in Trumptonshire had a job which involved doing something, and, accordingly, the programmes set the standard for blue-collar children’s television, to the point where successors in this area were destined to scramble for crumbs under the Trumptonshire table. Peter Hazel, the Green’s postman, pips Postman Pat by 15 years. Mr Clutterbuck predicts Bob the Builder. Fireman Sam was but a dim twinkle in the eyes of Captain Flack. Seen these days, of course, it can look slow. Indeed, viewed beside the hyperactive Lazytown, the average episode of Camberwick Green could well have been directed by Ingmar Bergman. Whole minutes seem to go by while someone is merely gathering the wherewithal to nod. This entry was posted in LunchBox, Pop Culture and tagged 1970 by Skooldays. Bookmark the permalink. Brilliant. I have no recollection of Camberwick Green toothpaste!! I heard that the show (or was it Trumpton?) is set to make a comeback! ?